HONOLULU – Save the date! The 18th annual Made in Hawaii Festival is coming to the Neal S. Blaisdell Exhibition Hall and Arena, Admissions Day Weekend August 17, 18 and 19, 2012. The Made in Hawaii Festival is sponsored by First Hawaiian Bank and produced by the Hawaii Food Industry Association. The annual festival features nearly 400 exhibitors who showcase food products, books, gifts, apparel and jewelry, arts and crafts, produce and many more home-grown products from around the 50th State. Live entertainment and celebrity chef cooking demonstrations also will have the “Made in Hawaii” brand. Award-winning musicians share their talent on the entertainment stage throughout the 3-day festival as Hawaii’s Hale Aina Award winning chefs heat up the stage in the Arena with cooking demonstrations and tasty samples. This annual event attracts more than 35,000 attendees each year. 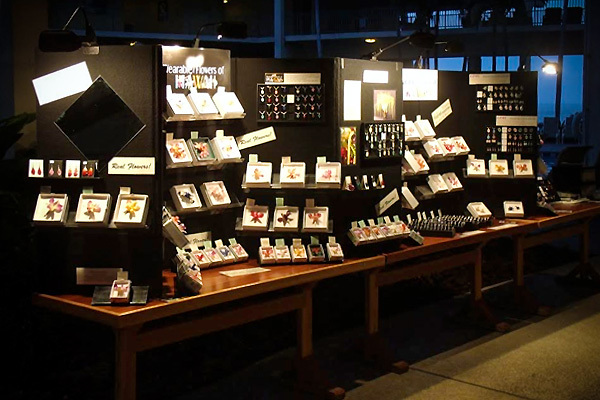 It also draws more than 1,000 buyers from Hawaii, the U.S. mainland, Canada and other countries who seek the latest locally made products to purchase in quantity in the months following the event. 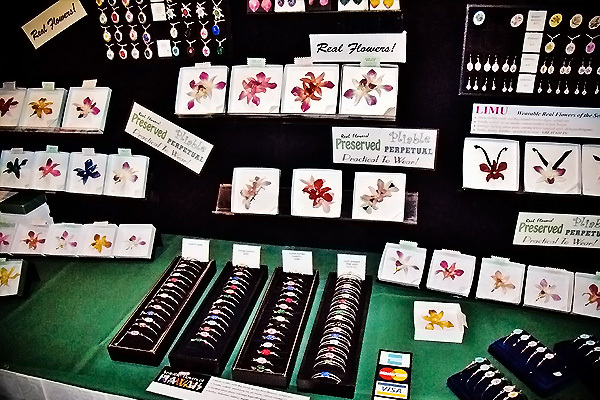 Real Flower Jewelry, also known as Wearable Real Flowers of Hawaii, will be especially making the trip all the way from The Big Island (The Orchid Isle) over to Oahu to be featured in booth 255, a prominent corner location in the Main Hall best accessed from the doors of the outdoor concourse between the Main Hall and the Arena. Peter Honeyman will be there throughout the event showcasing his new designs and colors and in particular, for first time viewing, his delightful new real orchid earrings and hair picks in various styles and colors to suit all personalities and the different tastes of both local Island girls and tourists. For information and updates, visit www.MadeInHawaiiFestival.com and follow us on Facebook and Twitter. A 3-day showcase of “Made in Hawaii” products, including food, books, art, gifts, fashions, plants, crafts, produce and more. Plus cooking demonstrations and ongoing entertainment. Friday & Saturday, 10:00 a.m. to 9:00 p.m.